A 15 year old Fast rising Nigerian saxophonist, Koyejo Adeniyi, also known as Koyesax is the last born of a family of five. He’s an alumni student of Corona School Victoria Island Lagos, where he was the head boy. He’s currently schooling at Lifeforte International High School, Ibadan. As a solo artist/saxophonist he’s also gifted with playing other instruments like the guitar, keyboard, drums and clarinet. He started playing the sax at age 9. Koyejo Adeniyi better known as ” Koyesax ” has played all over in the following places ; Abundant Life Church Lagos, Trinity House Lagos, RCCG Sheffield (Courage Centre), RCCG Leeds (Power Connections), RCCG Peterborough (Dominion Connection), Liberty Church London , RCCG Manchester (his fathers house), Global Impact Church (Good Land), God Bless Nigeria Lagos. Koye Sax got inspired by his Aunt Yolanda Brown, a MOBO award winner for jazz, when she came to Nigeria for a show by Veteran saxophonist and multiple awards winning Nigerian jazz artiste Mike Aremu, sax appeal where he fell in love with the saxophone. He went to a music school, “Fame Music Centre ” for only five days where he later picked up the rest of his skill by his own, but got some help from some saxophonist to improve on his skill like; Dele Sax, Victor Sax, Bimbo Sax and Yolanda brown. For Koye Sax, music has always been a therapeutic and enabling force which promotes 360 degree communication and empowering links across humankind and to win more souls for Jesus. To heal the blind and sick and perform signs and wonders. 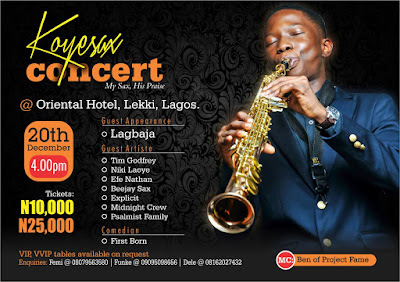 His forthcoming concert ”My Sax , His Praise with Koye Sax” will be graced by veteran Nigerian musician Lagbaja, while there will be music performances from award wining gospel artistes such as Tim Godfrey, Nikki Laoye, Efe Nathan, Midnight Crew, Beejay Sax , Comedy by First Born, while Ben Ogbeiwi of project fame is MC of the day. 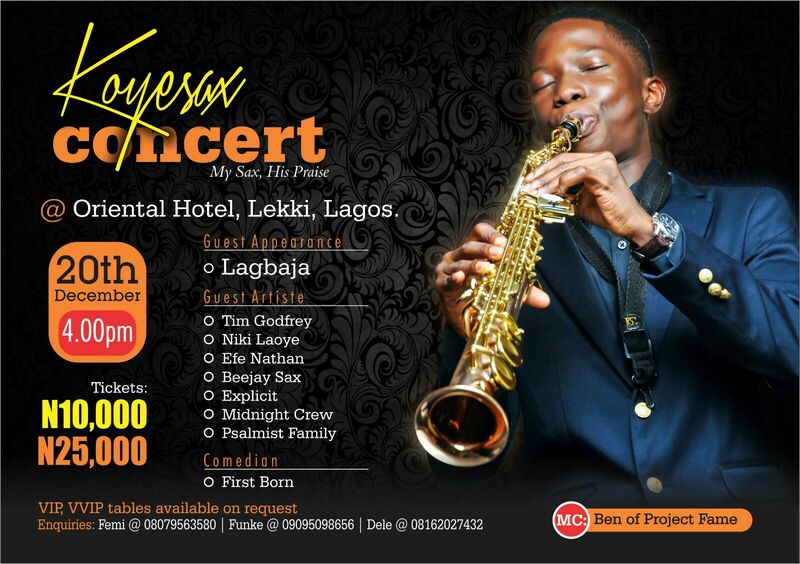 The Koye Sax Concert tagged ”My Sax, His Praise” is going to hold on 20th December, 2015 by 4.00 PM, at the prestigious Oriental Hotel, Lekki, Lagos. The concert is produced by Multiple Award Winning Producer Edward Sundayof Azusa Productions. Ticket: N10, 000 & N25, 000 Tables on request. You can order for your ticket online on Naijaticketshop.com or contact Femi: 08079563580, Funke: 09095098656 & Dele: 08162027432 .